Cladding which has been pressure treated (or tanalised) has been impregnated with Tanalith®E – the latest generation wood preservative. 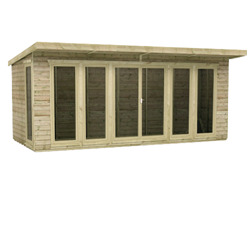 Our pressure treated sheds are completely protected against all forms of timber decay and insect attack, and therefore has a greatly extended service life that is guaranteed for 15 years. This extra 16mm thick, low maintenance cladding is used exclusively in the production of our premier range of garden sheds. 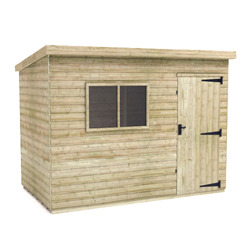 Find out more about our Pressure Treated Sheds range. Impregnated with Tanalith®E, an advanced preservative based on a copper triazole technology which has over 20 years of proven protection across a number of countries, our pressure treated sheds use innovative technology as a way of simplifying product maintenance. 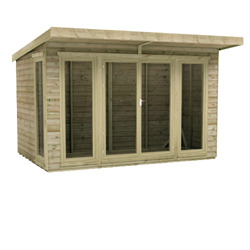 Manufactured within our Leeds based site each shed is hand constructed, meaning that we give the wood time to dry out and in turn this means that our deep tongue and groove finish has time to settle into its new shape. 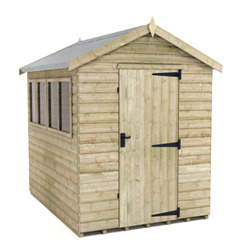 As part of a handsome range of sheds, each building is finished with Antique handles and hinges for a timeless effect. 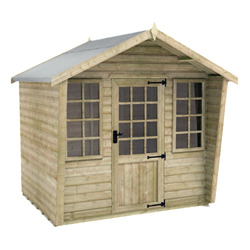 The Tiger Sheds pressured treated sheds looks beautiful and can be used as a fantastic garden shed. They come in a range of styles, such as apex or pent at a great price in a huge range of sizes. 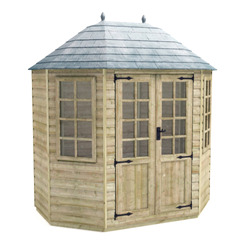 We also offer some unique styles which can work as a wonderful summerhouse such as The Tiger Elite Pressure-Treated Escape and the Elite Pressure Treated Octagonal. Free delivery on all these products across most of the UK.